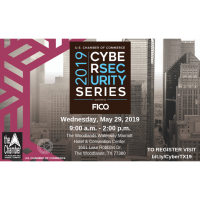 The Woodlands, Texas – The U.S. Chamber of Commerce, in partnership with The Woodlands Area Chamber will host the Cybersecurity Series: Greater Houston on Wednesday, May 29 from 9 a.m. to 2 p.m. at The Woodlands Waterway Marriot Hotel, located at 1601 Lake Robbins Drive in The Woodlands. The rapidly evolving cybersecurity landscape has been marked by more sophisticated attacks aimed at compromising and acquiring sensitive data as well as the disruption of organizational operations. Facing these growing threats, the importance of cyber insurance as a risk mitigation/risk transfer tool continues to grow for organizations of all sizes. This forum will focus on recent developments in cyber insurance. On behalf of the U.S. Chamber of Commerce and The Woodlands Area Chamber, we thank Gold Sponsor Wright Business Technologies for their support. Sponsorships and speaking opportunities are still available. Please direct inquiries to Vince Voci at VVoci@USChamber.com or Amy Weaver at AWeaver@USChamber.com. To register for this free event, visit bit.ly/CyberTX19.